Fewer uprates. Uprates to nuclear reactors, in which a power plant increases its maximum generating capacity, generally involve physically modifying the power plant and require the plant to be offline. Large or extended uprates may even be implemented over the course of two refueling outages. In early 2013, five reactors completed extended power uprates totaling more than 600 megawatts (MW), which required lengthy outages. In contrast, uprates currently under review and pending approval by the NRC total just 61 MW, and the NRC expects to receive additional requests for a total of only 580 MW between 2015 and 2019, out of a total capacity of 98.7 GW. Improved operating performance. 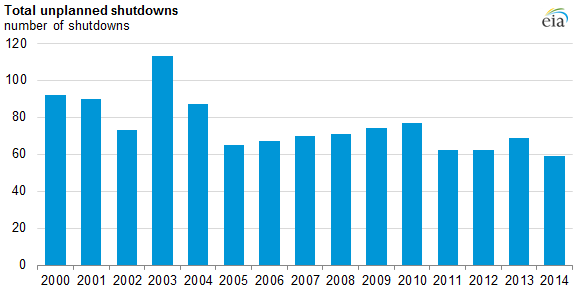 U.S. nuclear power plant performance and reliability have consistently improved over the past 10 years. In 2014, the nuclear fleet operated at an average annual capacity factor—the measure of the capability of a power plant to remain online and generate electricity—of 91.7%. The nuclear fleet's average estimated monthly capacity factor for August 2015 was 98.4%, compared with 96.4% for August 2014. According to the Nuclear Energy Institute, 95 of 99 operating reactors achieved a capacity factor of 90% or higher during August, and 48 of the nation's 99 operating nuclear reactors achieved a capacity factor of 100% or above—reported capacity factors slightly above 100% are possible because they are based on net summer capacity, which can be lower than actual maximum generation capacity. 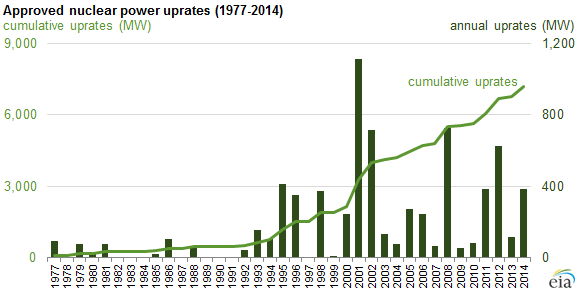 Unplanned automatic or manual reactor shutdowns also reached a record low of 59 shutdowns in 2014. 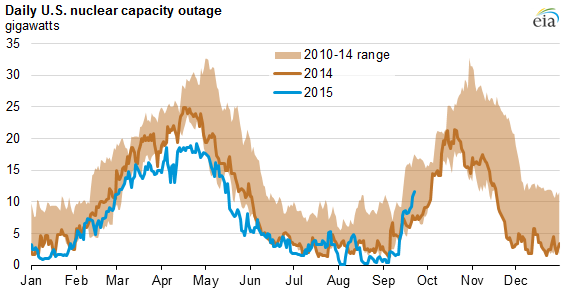 Continued efficiency improvements will shorten outages of nuclear power plants. However, as summer transitions to fall, outages are expected to increase from their historic lows as nuclear plants enter the fall refueling and maintenance season. Outages can be tracked on EIA's Status of U.S. Nuclear Outages website.